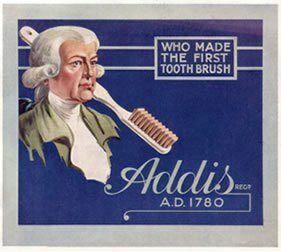 Wiiliam Addis developed the modern toothbrush in 1780. Addis was a prisoner in jail in 1770 for inciting riots. He was a clever man, who wanted to keep himself presentable but did not like using the method at the time of rubbing a rag with soot and salt on the teeth. So by hand he carved a small brush handle from bone. He drilled holes into the bone handle and inserted boar bristles that were held in place by wire. Addis starting mass-producing his contraption after leaving prison in Whitechapel, east London, England. His business boomed having to move premises. William died a wealthy man in 1808 leaving business to his eldest son, also called William. Addis began exporting products abroad to the US in the 1880’s. 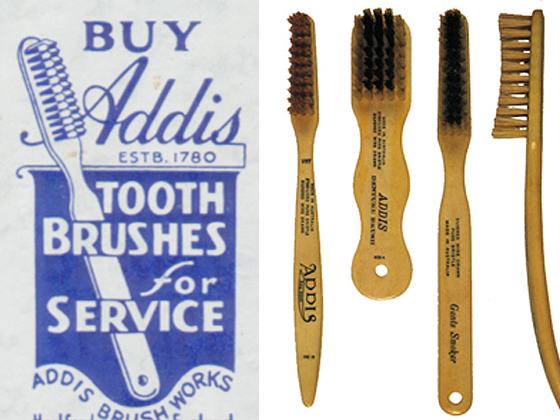 By the time WWII came along Addis employed 650 people and the first injection moulding machines were purchased and the first nylon toothbrush was launched (under the Wisdom brand). It stayed in family ownership until 1996 under the name Wisdom Toothbrushes. The company now manufactures 70 million toothbrushes per year in the UK. By 1938 the first toothbrush with nylon fibres was produced, which proved sturdier and more efficient than bristles. But in the United States it wasn’t until soldiers returned home from World War II indoctrinated with military hygiene habits that brushing one’s teeth regularly became a widespread practice. Previous to the manufactured toothbrush indigenous people have used, and still use, things like miswak from the twigs/roots of the Salvadora persica tree or similar to clean teeth.